It was recently claimed that “fresh insight” gained on Caravaggio’s painting technique supports David Hockney’s theory that the artist used a primitive form of photography to create his paintings (“Exhibition sheds new light on the art of Caravaggio”, Daily Telegraph report, March 11th). Diagrams, mirrors and light boxes displayed in an exhibition at the Palazzo Venezia in Rome, were said to “show” that Caravaggio “may indeed have” used a camera obscura to project figures on to a canvas so that they might be painted directly, with “extraordinary realism” and without any need for designs or preliminary studies. Showing that someone may have done something cuts no ice when logic, logistics and the laws of art all combine to testify against the Hockney hypothesis. “Insight” itself is a weasel term and is not the same thing as evidence. The art historian supporting Hockney’s thesis, Dr John Spike, offered the observation that “Gallileo was developing the telescope and they [artists] were all fascinated by optics” as if by way of some circumstantial corroboration. Whether or not they were so fascinated, we should note the absence of evidence and consider the logistical difficulties that they would have faced if attempting to work on the basis of the Hockney Hypothesis. Or should we believe that each figure was individually copied down, in full costume, exactly as seen when projected through a pinhole onto a wall in a darkened room? If so, was each painted figure subsequently “overlapped” and partly obliterated by the next in the sequence? Is there any material evidence of such overlaps? If not, we would have to assume that Caravaggio painted directly onto only that part of the projected image that would remain visible when the next figure was copied in. Timing is an important separate consideration: whether the models were depicted in entire groups or individually, how long would they have been expected to hold their usually animated and dramatically expressive poses (see right) in a compositionally perfect position in relation to other figures not yet posed or painted? There is another crucial consideration: were Caravaggio’s famously dramatic and theatrical lighting effects copied directly from nature onto the canvas via an image of a multi-figure tableau projected through a pinhole? Consider the exponentially increasing practical difficulties an artist would have to overcome when attempting to work in such fashion. Caravaggio would not only have had to paint at speed to avoid his models wearying and slipping out of pose, he would have had to have done so at a speed that would not allow the brilliant light source illuminating his figures to move – and to have done so when working not in front of his painting but to the side of the image projected upon it so as not to block it with his own shadow. Has any artist in history so handicapped his own labours? Would the light source deployed on Caravaggio’s frozen models have been the sun? If so, at what time of the day did he work? At noon, with the sun’s all-bleaching brilliant light at its zenith, producing unhelpfully top-lit figures? Or in the mornings and evenings when low, acutely angled, less bright but faster moving and changing? Did Caravaggio not only anticipate photography, but Impressionism too? Or, would his groups have been lit for long periods by a fixed battery of brilliant theatrical lamps? When it is claimed that Caravaggio had achieved the extraordinary realism of his paintings 200 years in advance of the invention of the camera, on the same logic it should further be claimed that he anticipated and emulated the achievements of the cinema. It took the full resources of modern cinema and means of lighting for Luis Bunuel to be able to compose and momentarily arrest a multi-figured tableau in mimicry of Leonardo’s The Last Supper in his film Viridiana. Is there any evidence that such human and technical resources were available to Caravaggio? Is it believed that Caravaggio had invariably worked in this manner? Or that he did so on some occasions but not others? Has any material evidence been found in Caravaggio’s paintings that reflects such radically different patterns of working methods? The real problem with the Hockney thesis, however, is not the absence of supporting evidence but the existence of contra-evidence. 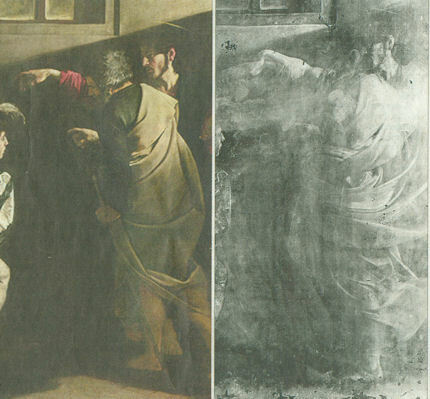 The Telegraph report is illustrated by a photograph of Caravaggio’s The Calling of St Matthew, and by an x-ray photograph of the two figures at the picture’s right-hand side. Those photographs (see above right) constitute a material record of both the paint that is visible to the human eye and the hidden earlier underlying painting. The caption claims that “x-ray analysis shows the style of the artist and supports the idea that he used a primitive form of photography in his work”. It is hard to see how this might be so. X-rays are notoriously difficult images to read with confidence because while they show all the successive states of a painting simultaneously they do not pick up all pigments and materials equally. Nonetheless, the x-ray photograph that is shown adjacent to the two figures helpfully permits direct visual comparisons. The most striking feature is that the underlying paintwork exposed in the x-ray is not identical with the paintwork that is visible to the human eye. Had Caravaggio worked in the manner being claimed, an x-ray would reveal no differences – no revisions, no “pentimenti”, nothing other than what was already visible on the picture’s surface. But the x-ray evidence here is doubly injurious. Firstly, it shows major changes to the pose of the figures – Christ’s raised arm is higher in the x-ray than in the painting while, conversely, his hand droops dramatically. Secondly, the image is sufficiently intelligible to establish major discrepancies of artistic style. In the space of the figure (St Peter) standing in front of Christ, the type of drapery seen in the x-ray photograph is manifestly different from that now seen in the visible paint above it. One observer (Giorgio Bonsanti) attributed the underlying drapery, on the basis of an earlier x-ray, to the figure of Christ – see right. Certainly as drapery it is greatly more accomplished artistically – more “Raphael-esque” – than the comparatively stiff, angular, “bent-tin” draped material seen on the St Peter. Most damagingly of all, this underlying painted drapery is not just finer it is of a type found only in art and never in nature. 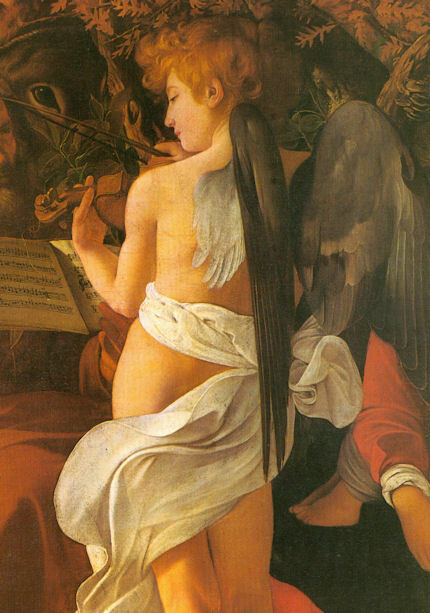 It is not some literal mechanical transcription of an actual draped garment, but a conjuring of spirited flowing, wind-filled forms that arc around the body and derive from the laws of drapery that were first understood and devised by the God-like artists of antiquity and then later rediscovered and emulated by the greatest artists of the Italian Renaissance. The living sculpture drapery revealed by the x-ray could not have been taken down from a static figure because it was an invention, a product of art and imagination that served the great powers of composition, design and expression – it conferred grandeur, grace and dynamism to the theatrical stage-right entrance of Christ. We might reasonably agree with Giorgio Bonsanti (see right) that Caravaggio, having first created this great glory, then opted to suppress his own magnificence of drapery so as to have the secondary, Christ-obscuring figure of St Peter serve as a dull mundanely reproachful foil to the wealthily and vibrantly attired group of figures to his left. 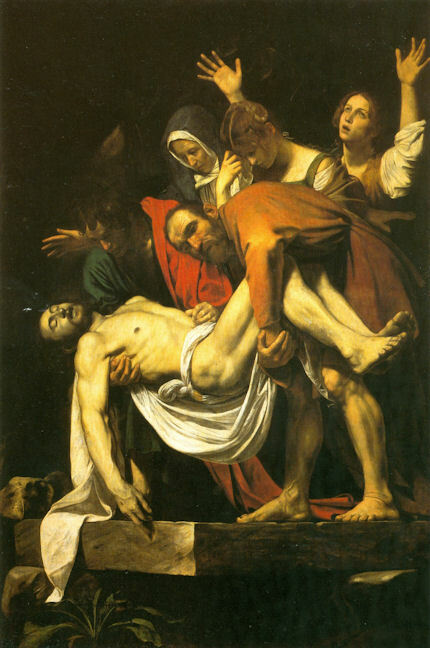 On the basis of this clear hard embodiment of artistically purposive thought and revision – to the point of artistic sacrifice – it can hardly be concluded other than that Caravaggio was a great inventive, self-critical self-revising showman of an artist and not some secretive shortcut-taking literalist. 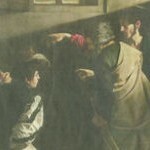 Above: the illustrations to the Daily Telegraph report “Exhibition sheds new light on the art of Caravaggio”, March 12th 2011. 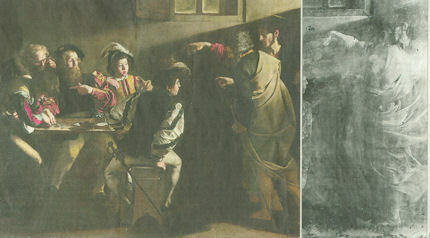 Above: a comparative detail of Caravaggio’s The Calling of St Matthew, seen in the painting itself (left) and in the x-ray (right). 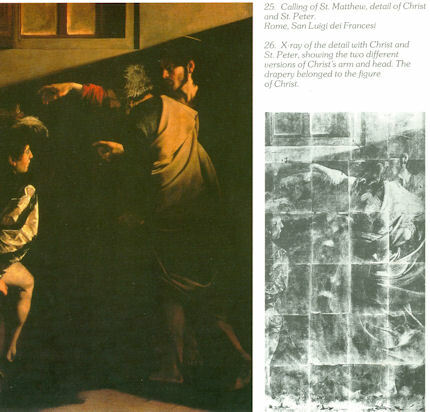 Note Caravaggio’s radical revisions of anatomy and treatment of drapery that can be seen in the x-ray photograph on the right. Above: Caravaggio’s Deposition, the Vatican, Pinacoteca. A depicted ensemble of figures that could not be held for longer than seconds by any group of living models.